...announce that you no longer have a preliminary release date, but a final one! As of Sunday last weekend, our Steam release date has been confirmed and as such the game will release on the 17th October. No more guessing or wondering required, and I can finally stop writing up comedic replies to those asking, so it's a win-win situation. Secondly, as you know we'll be attending the Sweden Game Conference on the 17th-19th of October, as well as the festival day on the 20th. Thirdly, I have previously unreleased information concerning something we'll be bringing along. Our very own flag, standing at a mighty 200 cm tall and 85 cm wide the banner of Lemon Curd Games will mark out our booth at the conference. You might then, quite reasonably, be asking: "But Linus, why aren't you showing us the concept that became the final flag design?!" Well my inquisitive friend, why settle for the concept? Keep an eye out for a real photo in the near future! Lemon Curd Games Confirmed for Sweden Game Conference! Exciting news! Having successfully pitched the game to the folks over at SGC, we will now have a booth in the IndieCator section of the conference, open throughout the event. Two Lemon Curd Games members will be running said booth, but should you visit you're likely to spot quite a few of us, sporting our dashing shirts. Later today or early tomorrow we'll announce who'll be running the booth, and hopefully a list of every attending member. Come say hi, play our game! Discuss the superiority of the lemon as a citrus fruit. Oh boy, what a summer! Here follows a short summary of what happened, please visit our Facebook page (click the Facebook icon on our page to be taken directly to it) to read each individual piece in full. 6/8/2018: We were nominated for two awards, for Best Execution in Art as well as Best Execution in Narrative! 10/8/2018: We did it! While we sadly didn't quite manage to get Best Execution in Art, we hauled home Best Execution in narrative! 14/8/2018: We were interviewed by the provincial radio section of P4, the interview then published online! Text within () is for context,  denote quick replies injected into the dialogue. "Last week the Swedish Game Awards were held in Stockholm, a game developer contest for students and independent game developers who want to gain some visibility for their games in the world. 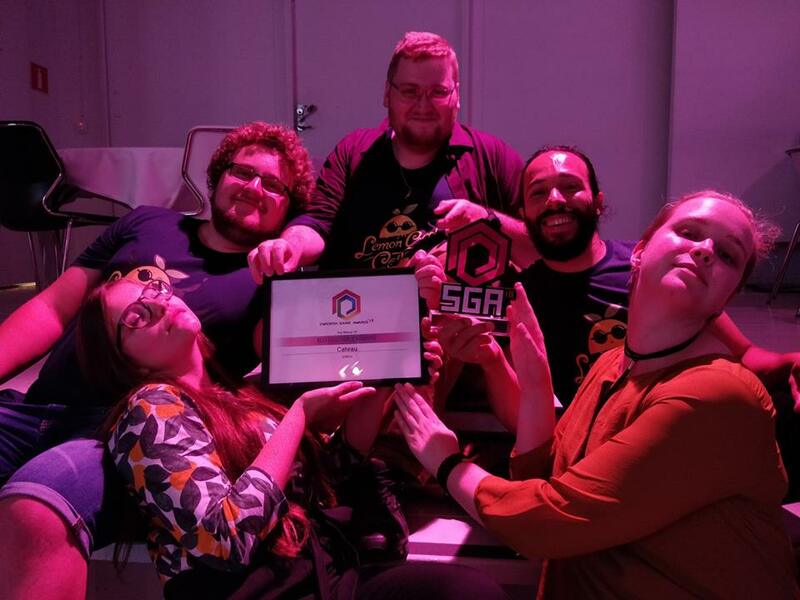 A gang of game development students from the University of Skövde brought home a prize in one of the categories with their game." Josefin: So now I have gotten myself to the University of Skövde, sitting here with two people from Lemon Curd Games, which is the group that won a prize in Stockholm with their game. 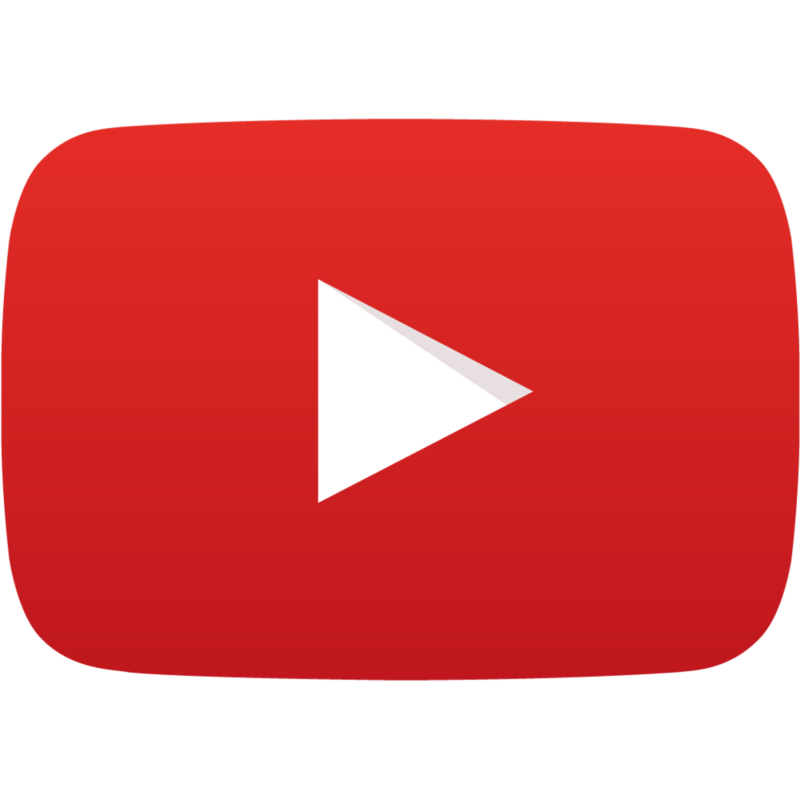 Cecilia: Yup, my name's Cecilia Höglund, I'm a lead for the graphics department, as well as having done voice acting, i.e. voices, for characters and the intro. Linus: I am Linus Persson Lundh, author and the one who manages our Facebook page as well as various other things on the web. Linus: Well the Swedish Game Awards is a competition mostly for students, as well as other enthusiasts and hobbyists within game creation, so not individuals who are professionally employed or have been in the past. Josefin: And, so when you decided to participate. was that a goal that you have worked towards long term? Cecilia: I would say that to begin with, we made the game specifically because we wanted to complete something and feel that we have actually created a game. It is our first year after all, so even just the feeling to have finished was a wonderful experience, but then later we received information that this contest existed, Swedish Game Awards as it's called. There you could send it in (the game), which is precisely what we did. Josefin: And then you even won in one of the categories? But it's also important to note that we got nominated in graphics, (Best Execution in Art) and it's also very important to keep in mind that regardless of the fact that the nominations concern very specific things, that we never would have gotten to that point without the group. Say for example that we had been dissatisfied with how the game was presented, then we never would have submitted it. So how did it feel once you found out that you had been nominated? Cecilia: It's indescribable, really. I think that I'm not alone within the game group saying exactly that, it being the first year (of studies) and everything. To all intents and purposes, we'd been working within our fields for half a year, I really can't even explain it with words. It was your birthday too Linus, at the same time, so congratulations on that. Josefin: And then you brought home the prize in one category as well, so then it must have been even more joyous if at all possible? Linus: Being the author, saying that it (the sensation) is beyond description is probably a poor omen as to my future prospects, but that's simply the way it is, it can't be described, that emotion. I remember that having well received the prize I sat there with the plaque staring at it for some five minutes, completely oblivious to the fact that at the bottom there was prize money. So our colleague Anderson who worked on the music and did a fantastic job, he went "Have you seen this!?" and then I went "Huh, what? Oh!". It's plainly completely surreal. Cecilia: And I do believe that we screamed the loudest in the entire room when the prizes were awarded. Josefin: So the game that you won with, that you worked on with your colleagues, can you tell (us) what it's called and what it's about? Linus: The game's called Cateau, which is a game about what friendship truly entails, to put oneself in a situation with which one isn't comfortable or familiar in order to help one's friend to get better. That's the story in a nutshell. Josefin: Within the title then, Cateau, can one guess that it involves cats in some way? Linus: You can, for it certainly isn't the battle (by the same name) during World War I that we're talking about, so it's cats that we are discussing here. Josefin: So what do you get to do within the game then? Meet cats, something else perhaps? Cecilia: Yes, precisely. So one plays as the protagonist, friend of the character Roselle. Roselle begins to feel very poorly, and then it's about friendship as Linus said before, so one might engage in things that you're very uncomfortable with. Particularly meeting cats in this case, which the protagonist isn't comfortable with. 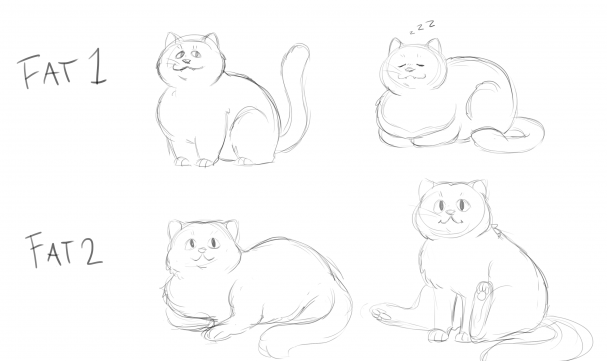 Doing so you encounter many cats with different personalities, and Roselle then begins to grow more and more with time in the game. Josefin: And with the game looking as it does today, is it completely finished, have you been able to publish it in some way? Cecilia: I would say that a game is probably never completely finished, but on the other hand we're extremely proud of what we have accomplished and the plan is to publish it within the near future. Today's a big day for all of us here at Lemon Curd Games. 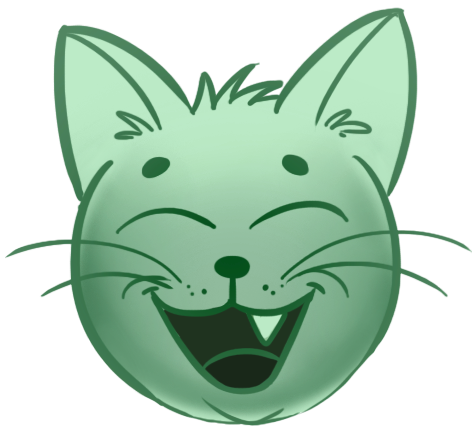 After weeks of polishing and hard work, we're pleased to finally be able to tell you all that Cateau has now been submitted to the Swedish Game Awards! And to top it all off, we have a new, final trailer to share with you all. This will serve as both our SGA trailer, as well as the final release trailer later on. Oh dear, I've gone and written those two big ol' scary words - final release. On the subject, all I can say at this present moment, is that we're looking to release it once the SGAs are over. Due to being a group of fifteen people, it's a bit of a hassle to coordinate a final meeting in the matter during the summer months. We're aiming to have said meeting as soon as possible, so that we can at last give you an actual release date. In the meantime, please enjoy the trailer! It shows off, among other things, the newly improved character reactions. Hello there! How about a quick update? Well I suppose that the arrangements could be made! It'll be short (unless I am lying, which is a stark possibility) and sweet, much like a lemon. Well, a sugar-coated lemon, but that's besides the point. First off, let's begin with what the programmers have been up to in their secret underground coding bunkers. While the primary functions of the game were mostly complete, there has been some additions and revisions. At present, all the mechanics and functions are in place, and they're at work implementing and polishing the reworked or added content for the improved version. Secondly, the sound design fellows have been working on adding more sound effects, including ambient sounds but also user interface and action feedback. The former ties into something that our artists have been up to. 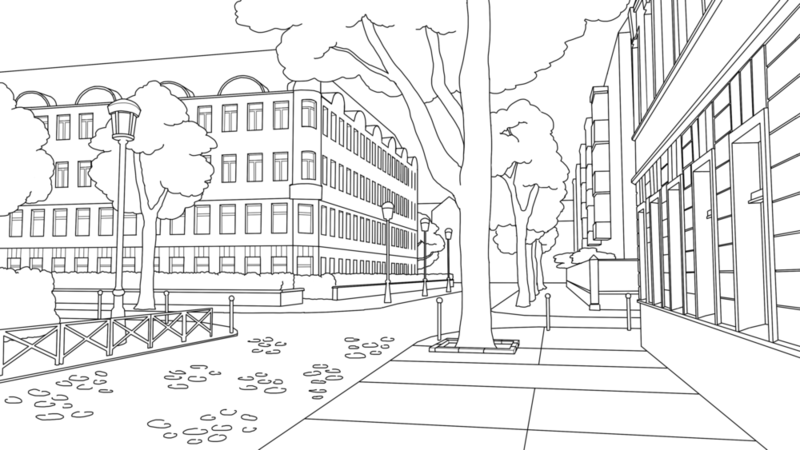 Our artists have been toiling to improve the, for the lack of a better term, "liveliness" of the game. This includes, for example, the upgraded reactions and character expressions mentioned in the last update. For example, while "Donny" used to have three distinct reactions, the sly bugger's now got six of them, each with a day and night lighting version. Not only that, but to help convey to the player whether or not their action had a negative, neutral, or positive effect, they've created a set of emojis that'll appear to clarify the results of an interaction. In the writing department, focus has been placed on giving the player more time with the other human character in the game, as well as improving the clarity of the chronological progression of events and the efficacy of written scene transitions. It seems that I did indeed lie! But, your patience will be rewarded. Here's one of the emojis for you to have a look at. The usual disclaimer applies, that facts and images relayed and shown here are subject to change up until final release and may differ from the final version. Greetings! It's sure been a while, and you'd be forgiven for expecting this post to be covered in cobwebs. Fortunately as this is the internet, spiders have difficulty getting their web all over the place. All joking aside, we're nearing the end of the current semester, and we'll be finishing up our respective coursework over the next week or two. What that means in practical terms, is that we'll be getting more work done on the game. In brief, there'll be refinement of character presentations which in turn allows us to remove the text describing character reactions, resulting in a more concise narrative. As this will be taking place during the summer holiday, we cannot promise regular updates on this page, or that we'll even succeed at completing the improved version. I guess we'll all have to wait and see, don't we? All joking aside, we have news concerning release date time frame! And yes, that does actually involve a plan. As some of you may already know, we're planning on polishing the game and then submitting the result to the Swedish Game Awards. The submission window's between the 1st and 29th of July this year. Our exquisitely ingenious, original and unrivalled scheme, is to release the version we hand over to SGA, rather than the version we currently have. What this means of course, is that that is indeed our release window. Fret not, it will still be very much the same game! The new version will not be a radical redesign, but rather amending the issues that were found during the project. Increased interactivity, improved visual representation of character reactions, and thanks to such improvements allowing the text to be more concise, we can make the reading experience far more engaging. In short, we want you to experience that, rather than what we handed in. There will be more updates during these coming months, but as we've all moved on to new courses, this is now something we spend our free time working on. 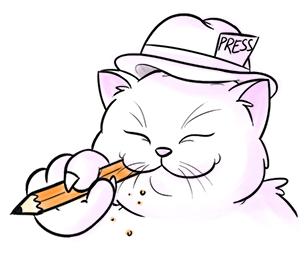 That means that updates will be less frequent by nature, but we will relay any newsworthy progress to you all. Thank you for taking your time to read this and your continued support! Sorry for the long read, but as it's been a while since you last Heard from us, we wanted to make sure that we brought you up to speed. To say that this has been a busy week would be an understatement of criminal proportions, but we've finally finished creating the elements for the game, ready to be implemented into the final version over the next few days. Good thing too, as the deadline's coming up! On Thursday we'll be holding our final presentation as a part of this course and project, which unless things change in the next few days, will be streamed live. Updates on the matter will be published before then. You might wonder what that means for the release version of Cateau? All we can say for absolute certain is that the game will be released to the public, but we have yet to set a defined release date. Again, updates on this will be published in the near future. A bit of a dense read this one, but there'll be a more bite-sized message later today! Well well well, look at what arrived in the mail today! No, not the developers, the t-shirts. Every member's got one, but not every member is featured in the photos. In case of the third photo, teamwork makes the dream work! So far, our news updates have largely been focused on presenting the audiovisual elements of our game, such as concept art, characters, music and so on. But, as unlikely as it might seem, there is actually some writing work involved in making a visual novel. An unsettling revelation perhaps, but an undeniable truth nonetheless. So, how does the writing process work here at Lemon Curd Games? Well, as is often the case with creative work in general, it's an iterative process so it varies somewhat depending on what element is being worked on. But to keep this article from being approximately the length of the written works of Classical Europe, I'll describe how an encounter between the player and the cats they encounter. To begin with, the writer or writers discuss what event the encounter will revolve around, each one typically centred around one particular event. From that core idea, the choices, results and consequences are worked out. Then, a rough draft is written, where each choice and result is given text. Then, from that first draft, a second draft is made. Once both of these are complete they are reviewed, and the text passing said reviewing process is compiled into a final draft. While hardly as glamorous as some of the other work that goes into a game, certainly less visually appealing as the art or interesting to listen to as music, but we hope that you've enjoyed this piece of insight. At this point you're likely familiar some of our line art, the piece being the subject for this article even being used as our facebook banner at the time of writing. It's part of the conceptual process that our artists go through, creating simple line art and then embelleshing the pieces chosen for refinement. We figured that you might enjoy a good old "before and after" example. So here you go, that very same line art along with the colour corrected version we currently have. As with most of our assets, please note that even this is not fully completed and is currently being worked on, but in this case it's minor detailing, meaning that this is very close to what you'll see in Cateau. Teaser Trailer Featuring Prototype Footage is Now Live! Our first, fully fledged prototype teaser trailer, featuring our brand-new logo, but in all of its animated glory, as well as all kinds of assets that will be implemented in the finished game! Pretty neat, huh? While we hope that you'll enjoy the trailer, please bear in mind that this is still a work in progress. For example, none of the text is proof-read, which would be a tad embarrassing in a final release version. There's More Than One Way to Colour a Cat. Just like how Bond's had many suits over the years, so too did "Donny". Well, if the suit was fur and the time span referred to days rather than years. Here is some of the later concept art that determined which colour palette was chosen, once the general appearance had been decided. It's about time that we introduced you to a new cat, isn't it? Well here is the second of our three cats, code named "Donny". "Donny" is the boss of the street and knows it too. The idea behind the general design is to convey a personality which cannot be bothered with rapscallions and rascals faffing about, hardly a youngster any more but certainly capable of taking care of itself. Our First Fully Featured Music Trailer is Up! In this video put together by graphic designer Cecilia Höglund, you can enjoy the music created by our composers Anderson Lima and Tony Martinsson, featuring background art by Santino Cimino. Click here to go to the trailer on YouTube. The Journey of "Chub" Concluded! "Chub's" evolution into the current form was, as is usually the case with creative work, a process of iteration. However, the earliest roots into the current design can be seen here, where work branched off from early concepts into a more focused direction, leading to the current design. The Saga of Chub Continues! Fancy stopping by the residence of the venerable "Chub"? Step into his parlour (conveniently situated right by the local bakery) and have a look at what Chub's home looks like. In other news, our website has just hit over 100 unique visitors! Thanks to all of you from various countries around the world including Sweden, Cyprus, Germany, Japan and the United States among others, in no particular order. 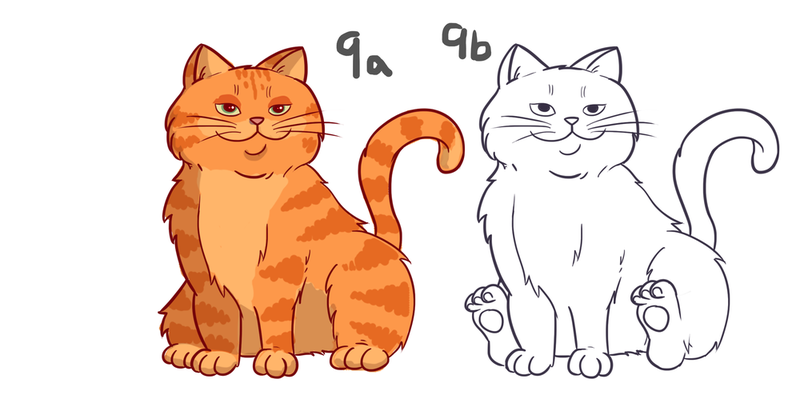 Development Insight 1 - The Journey of "Chub"
Did you know that our logo, derived from the "fat cat" character code named internally as "Chub", began life as an orange bundle of smugness? Well due to what was in retrospect a fairly obvious reason, wishing to avoid infringing on another, fairly famous orange cat, the oranges were swapped out in favour of darker colours? Well if you didn't know, now you sure do.